Vanguards and Justicars have the same Crush skills. Templars have the same Crush skills as a Crusader. Justicars and Templars get more Blockade skills and no Spear skills. Both Justicars and Templars get buff spells. Justicars can heal and revive dead players while Templars get Summons. Description: Attacking enemy with a wartool. Description: Attack an enemy to draw its attention and gain aggro. Attacking from behind will cause more damage. Description: Enables the use of two one-handed wartools in combat. 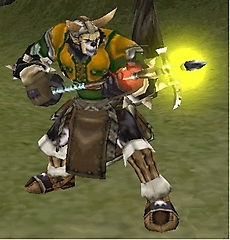 Description: Chop at an enemy's wrists, reducing Attack Power. This acts more like a damage shield. Enemies that attack you will take a small amount of damage. Damage seems to equal the duration in seconds. Description: Sacrifice Health to deliver a fierce blow against an enemy. Description: Pierce an enemy in the leg, immobilizing them. More ffective against summons and tamed beasts. helpless and unable to act. Description: Stab an enemy to create an infected wound. Has a chance to cause poison. also reduces their attack speed. Description: Slices surrounding enemies with a powerful flurry. Does more damage against enemies with status ailments. Not a damage reflect skill, but a damage shield. Enemies that attack you will take a small amount of damage/hit when within 2m. Note: Damages shown reflect base values w/o equipment.